· It continues the development of the PFU copula. · PFS inessive *-sna/-snä and elative *-sta/-stä continue the lative *-s.
· Local cases in *-na/-nä and *-ta/*-tä, from the PU locative *-na and ablative *-ti. · PFS essive of the possessive adjective *i̯na/-i̯nä, *i̯ni/-i̯ni, from the PU plural oblique *-i̯, and *-ni as a variant of *-na/*-nä. · Infinitive in *-tak/-täk, consisting of PU deverbal suffix *-ta/-tä + lative *-k.
· PFS Present participle *-ja/-jä, perfect participle *-mi-nśi, from PU *-mi and diminutive suffix *-nśi. · Abessive of deverbal noun formed with PFS suffix *-kka/-kkä. · New deverbal and denominal suffixes as combinations of common PFU forms. · Further development of the copula, with reinterpretations leading to the “negative past” (from the former copula-less perfect). · Development of the partititve case, apparently in close areal contact with Baltic languages (or adopted later by Baltic languages): With intransitive verbs of existence (express the simple fact that something exists or not), indefinite plural and mass nouns appear in the partitive case. · Adjectives agree in case and number with their head nouns, possibly due to Baltic or Germanic influence. · Noun paradigms and the form and function of individual cases. · The geminate *mm (foreign to Proto-Uralic before the development of Fennic under Germanic influence) and other non-Uralic consonant clusters. · The change of numeral *luka ‘ten’ with *kümmen. · The presence of loanwords of non-Uralic origin, related to farming and trees, potentially Palaeo-European in nature. On the other hand, certain Komi and Udmurt words can be better explained as borrowings that spread from the west rather than reconstructing two different close forms, which suggest a period of contact likely during or after the eastward expansion of Fennic, corresponding to the Middle Ages (Saarikivi 2018). · Grade alternation, contractions, and to some extent metaphony brought a shift towards a fusional instead of agglutinative morphology. · Conservation of the dual (in contrast with other Finno-Permic languages). · Genitive and accusative singular syncretise after the loss of final nasals. · Locative singular continues the former inessive and elative. · Comitative singular from PFS *i̯na/-i̯nä. · Essive from PU locative *na/-nä. · Sami declension suggests a PFS system with no specific local cases in the plural. · Possessive suffixes undergo a radical simplification. o Extensive innovations in the vowel system: in the first, second and third syllables. o The consonant stock is fairly conservative, characterised by the extensive use of the opposition of voice; changes include PFS post-alveolars into PS dentals, PFS *k → PS *v before *i̯, *l, * ń; and in consonant clusters *ns → PS *ss, *si̯, *ši̯→ PS *šš. o The distribution of consonants is also highly skewed, with severe restrictions on their occurrence everywhere except in the consonant centre. Based on the estimated location of the Finno-Samic-speaking community around the Gulf of Finland during the Bronze Age (see below), it is likely that both (Palaeo-Lakelandic and Palaeo-Laplandic) communities were related to contemporary asbestos ceramic groups of north-eastern Fennoscandia. 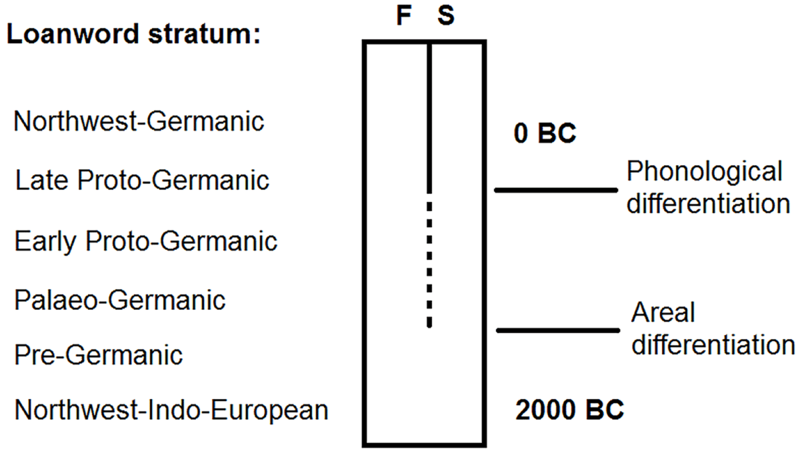 Lexical borrowings between Germanic and Finno-Samic languages have been stratified by Jorma Koivulehto in thorough studies of Germanic loanwords into an old stratum, often shared between Fennic and Samic languages, and a later one, which is probably to be identified with a Proto-Scandinavian stage (Figure 8). Further classification into different stages has been done more recently (Lexikon der älteren germanischen Lehnwörter in den ostseefinnischen Sprachen 1991, 1996, 2012). “Even though Bronze-Age Finnic and Samic were still two dialects rather than two languages, it does not mean that they would still have been spoken in a geographically limited area. On the contrary, their Indo-European loanwords dating to this period indicate that their speech areas were already geographically separate. The fact that at that time both Baltic and Germanic influenced Finnic much more strongly than Samic must be considered a crucial piece of information when we are trying to locate the Finnic and Samic homelands. (…) the fact that Palaeo-Germanic loanwords are much more numerous in Finnic than in Samic must lead to the same conclusion. As I noted above, the most likely Palaeo-Germanic speaking carriers of the Nordic Bronze culture (ca. 1700–500 BC) spread from Scandinavia to the Finnish and Estonian coastal areas. As they never spread any further to the east than as far as the bottom of the Finnish Gulf, the idea that the Finnic homeland included neither Finland nor Estonia completely fails to explain the very existence of Palaeo-Germanic loanwords, whose quantity and quality in Finnic presuppose a superstrate rather than an adstrate. Figure 8. The Finnic and Samic separation looks shallower than it actually is. Invisible convergence can be ‘triangulated’ with the help of Germanic layers of mutual loanwords (Häkkinen 2012). Palaeo-Germanic words in Proto-Finno-Samic, and later in Proto-Finnic and Proto-Samic, counted in hundreds to more than a thousand depending on the dialect, are described as of a superstrate influence, while the dozens of Indo-Iranian loanwords consist mainly of cultural borrowings, which may thus represent a simple adstrate through language contact (Kallio 2017). The early stratum, called Palaeo-Germanic, is dated between Pre-Germanic and Proto-Germanic, and may today be divided in two periods. · Gmc. *φastu- < Pre-Gmc. *phasto- ‘firm, solid’ → PF *pasto ~ *paasto ‘fast’. · Gmc. *φelϑa- < Pre-Gmc. *pheltho- ‘field’ → PF *pëlto ‘field’. · Gmc. *xansō < Palaeo-Gmc. *kansā- (<Pre-Gmc. *kom-sā-) ‘troop’ (cf. OE hos ‘crowd, host’, OHG hansa ‘id.’) → PFS *kansa, cf. PS *kuossē, Finn. kansa, ‘people, crowd’. · Gmc. *xardi̯a- < Palaeo-Gmc. *karti̯a (<Pre-Gmc. *kort-i̯o-) ‘to harden, to endure’ → PFS *kärti, cf. PS *kiertë- ‘endure’, Finn. kärsiä ‘to suffer; to endure’. · Gmc. *xargú- < Palaeo-Gmc. *karkú- (<pre-Gmc. *kark-ú-) ‘heap of rocks; sacrificial site’ (cf. ON hǫrgr) → PFS *karko(i̯), cf. PS *kuorkō(i̯). · Gmc. *xaɸa- < Palaeo-Gmc. *kāpa- (<Pre-Gmc. *kōp-o-) ‘hoof’ (cf. ON hófr, OE hōf, OHG huof) → PFS *kāpa, cf. Finn. kavio, + suffix *i̯a-u̯. · Gmc. *sōki̯a- < Palaeo-Gmc. *sāgi̯a (<Pre-Gmc. *sāg-i̯o-) ‘seek’ (cf. Goth. sōkjan, ON sœkja, OE sēcan, OHG suohhen) → PFS *šaki-, cf. Finn. hakea ‘seek’. · Gmc. *u̯arō < Palaeo- and Pre-Gmc. *u̯osā → PFS *u̯os-ta (cf. Finn. osta- ‘buy’, Saami oasti-), *u̯osa ‘ware, commerce, purchase’ in Finnic dialects (Koivulehto 2003). · Gmc. *rexta- < Pre-Gmc. reghto- ‘straight’ → Pre-PF *rehta ‘row, line, side, sight’. Its derivation from Pre-NWIE *rehdhā (cf. Gmc. *rado, ‘row’, ultimately from DIE *rehdh- ‘achieve, accomplish’) into Pre-PF *rešta-, as proposed in Koivulehto (2003), seems much less likely. Words from this stage are thus marked by the presence of Pre-Gmc. *ā (→ PFS *a) before it merged into Gmc. *ō. In the case of *kōp-o-, it has been argued (Kallio 2015) that it is a merge of Pre-Gmc. *ā, *ō into Palaeo-Gmc. *ā, before it becomes Gmc. *ō, shortly after the Proto-Germanic expansion (Van Coetsem 1994). · Gmc. *xamen (cf. OHG hamo ‘hunting net’) → Pre-Samic *amin ‘a kind of hunting fence’. · NW-Gmc. *hāba-z (< Gmc. *xēba-z, cf. ON háfr ‘pocket net, hoop net’) → Pre-Samic *api/as ‘depth of fishing net’. · Gmc. *hasi̯a- (cf. Ice. hes ‘skin pouch’) → Pre-Samic *asii̯o ‘bellows’. In many borrowings, the vowel shift PFS *a → PS *uo had not yet happened, but no Gmc. *x is found in the borrowed word, so no exact (early or late) Palaeo-Germanic stratum can be assigned. There are also cases in which the same Germanic word seems to have been borrowed independently by Proto-Samic and Proto-Fennic (Aikio 2006). Later contacts between Proto-Germanic or Northwest Germanic and Middle Proto-Fennic, which must be dated to the Pre-Roman Iron Age (ca. 500–1 BC) or later, are reviewed in Kallio (2012) and Kallio (2015). Proto-Scandinavian loanwords in Samic, potentially of a slightly later date, are reviewed with detail by Aikio (2006). The split of Proto-Fennic can be explained as being caused under the strong influence of the initially bilingual Pre-Germanic/Proto-Fennic community in Scandinavia (see above §4.12.2. Finno-Samic influence on Pre-Germanic), which suggests continued, long-lasting contacts between both early communities in contact through the Baltic Sea. · Loss of the entire PFS palatal series (apart from *i̯), with a later loss of fricative ð (later also found in Proto-Germanic), and disappearance of *ŋ, all sounds which Pre-Germanic lacked. · The only increase in consonants is in the number of long (geminate) consonants: *ss, *mm, *nn, *ll, which parallels their appearance and development in Germanic. · The contrast between dentals and alveolars has disappeared: out of three different s-sounds only one remains. · Development of *h (Germanic developed *x). · Rhythmic gradation turns all voiceless obstruents after an unstressed syllable into weak-grade consonants, which means that PFS *p, *t, *k, *s, become PF *b/*v, *d/*ð, *g/*γ, *z. This is paralleled by the effect of Verner’s law + Grimm’s law in Proto-Germanic (see above §4.12.1. Germanic evolution). · The loss of *i̯ could be motivated by the absence of that sound in Germanic. · The loss of vowel harmony and its replacement by Umlaut introduces a Germanic feature into Samic. · The lengthening of *æ, *a, and *ɔ to *ǣ, *ā, and *ɔ̄ brings the Samic vowel system closer to that of Proto-Germanic. · The development of *ā and *ǣ in stressed syllables matches Germanic changes. · The same can be said about the split of *ā and *ɔ̄ in unstressed syllables. Many traditionally described Baltic loanwords in Finnic, around five hundred of six thousand commonly used words, can in fact be traced to a Proto-Balto-Slavic stage, and many (around 10%) of those loanwords are also found in Samic, which points to a moment of separation (but close contact) of the Proto-Finno-Samic community as the relative period of acquired loanwords. Some of these loanwords have also been proposed to derive from an (unattested) early Proto-Balto-Slavic dialect, ‘North Baltic’ (maybe closely related to West Baltic). This would support continuous, long-term contacts in at least two distinct periods in the Baltic region: Proto-Balto-Slavic–Proto-Finno-Samic, and Early Proto-Baltic–Proto-Fennic (Kallio 2008) and Proto-Samic (Kallio 2009), which should be added to the described Early Proto-Slavic–Proto-Fennic contacts (Koivulehto 2006). · BSl. *p, *b → PFS *p; BSl. *t, *d → PFS *t; BSl. *k, *g → PFS *k; no palatalisation of velars had taken place before front vowels: Lith. gẽltas ‘yellow’ ~ Finn. kelta, Lith. kirvis ‘axe’ ~ Finn. kirves; Lith mazgói̯u (<*BSl. *mozgēi̯e-) ~ Est. moske-, Hung. mos-. · Interesting is the lack of reflexes for a reconstructed laryngeal *ʔ in Proto-Finno-Samic, which further supports its disappearance in the common NWIE stage, against Kortlandt (2016). · BSl. *s → PFS *s, i.e. borrowed before its evolution into PF *h; BSl. *ś (also *ź), *š → PFS *š, which may point to a period before, during, or after their merge in PFS from a PFP stage. · Resonants were kept, but for BSl. *u̯ → PFS *v (there was no bilabial in PFS). · Similar vocalic outputs. Interesting is the reconstruction of BSl. *o, *a → PFS *o, *a in loanwords, which points to a period before their merging in Balto-Slavic, cf. Lith. taũras ‘auroch, bull’ ~ Finn. tarvas ‘elk, roe deer’, but Ltv. tàure ‘horn’ ~ Finn. torvi ‘horn, pipe’. · The adoption of diphthongs may have undergone different outputs. Interesting (in relation with a parallel development in Proto-Ugric, see below) is the adoption of BSl. źmōn ‘man’ (<*ghmōn, see §3.2.4.1. Remade Late PIE stems) → PFS sōme → Finn. Suomi, Est. Soome, the self-denomination of all Finnish peoples, originally probably ‘man’, also behind the term Sámi for Samic peoples. It would else be reconstructed as PFU **śoma or **ćoma (Koivulehto 2003). Compare also Mordvin self-denomination miŕd’e ‘man, husband’, also Mari ‘man, human being’ (see §3.5.2. Contacts with Indo-Iranian). For detailed reference of loanwords, one can consult the (out-of-date) standard handbooks Thomsen (1890) and Kalima (1936). Still later contacts are represented by Latvian and Old Russian borrowings in Fennic languages. tan kūltiliminśi lampa kentäsin korkëi̯. · For the verb ‘have’, the possessor would have been probably in essive, and the object in possessive. In PFS, an abessive in *-pta/ptä-k can be reconstructed, hence it is used with the verb to be, instead of a negative construction. · The elative in *-sta/stä is used to indicate that is made ‘of wool’. The prolative in *-ko is used with present participles to indicate ‘by (way of)’. · PFS *lampa ‘sheep’, a loan from Palaeo-Gmc. lambhes- (<*lon-bhes, cf. Gmc. *lambiz-) ‘lamb’. Because of its meaning as ‘sheep’ in Gothic and Fennic, it has been used to support the hypothesis that the Goths emigrated from Gotland (Kroonen 2013). · PF *villa ‘wool’, a loan from BSl. *u̯ilnā (cf. Lith. vìlna) is here supposed to have been adopted first as PFS *vilna, and then borrowed again in PF. Saami languages show a loan from Proto-Scandinavian, *ul’lu. · PS *losē < PFS **lusa, described as dating to a common PFS period in Sammallahti (1998). · Finn. vaunu < *vagnu < PFS **vakna < Gmc. *u̯agna < PreGmc *u̯oghno-. We assume an older Palaeo-Gmc. loan, and not Gmc. or Proto-Scandinavian (cf. Swedish vagn).